It feels as though organisations and disabled people have been saying this for years. So why aren’t we seeing this number increase? Something about our approach to this problem isn’t working. But how are we going to change this if they can’t get the jobs to prove that they are? How can we improve understanding of what people can do? How can we give everyone the chance to shine? Abul works as a Quality Checker for My Life My Choice. At My Life My Choice, we recognise that people with learning disabilities have unique skills and insights that those of us without a learning disability do not have. And we use those to provide employment opportunities. Travel Buddy. Who is best placed to understand why some people with learning disabilities struggle to use public transport? Other people with learning disabilities of course! After an initial assessment by our Travel Buddy Coordinator, people wishing to learn how to travel are “buddied” with someone who is a confident traveller, who works with them one on one until they are able to complete a journey by themselves. Inspect services. Our “experts by experience” know exactly what good care looks like for people with learning disabilities, because they have a learning disability themselves. We’ve partnered with Oxfordshire County Council and Choice Support/CQC to provide paid inspections work for our members. Provide training. Who is going to do the best job of telling you what it’s like to have a learning disability? Or how to communicate or work with learning disabled people? You’ve guessed it – people who have a learning disability! (I know, this is getting repetitive). Our Power Up Trainers get paid to deliver training to a wide range of audiences. Provide expertise. 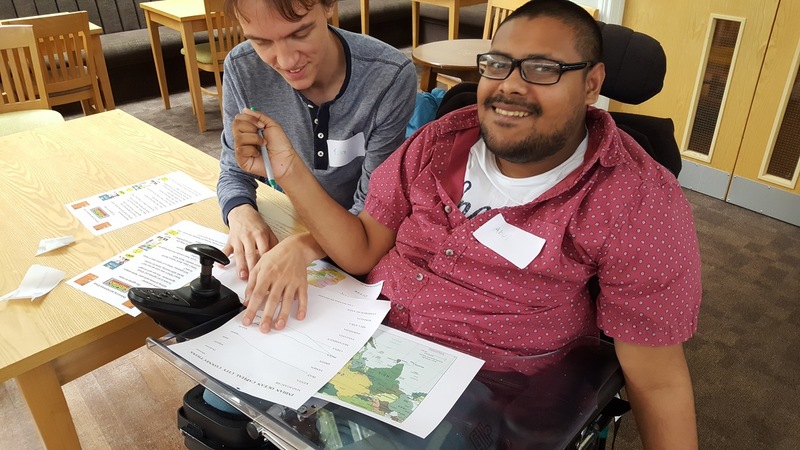 Our members also get paid to consult with organisations such as NICE, the NHS, NDTi and Bristol University, about what it’s like to have a learning disability. Provide easy read guidance. When we translate documents into easy read, we pay people with learning disabilities to make sure they make sense. We think this – paying people on a freelance basis to do work only they (people with lived experience) can do – could be the best way of increasing employment of people with learning disabilities. People are empowered because they are using their skills, getting paid and meeting people. Freelance consultancy work is great for people who can’t work full time due to their disabilities – they can pick and choose their projects depending on their available time and energy. They can continue to receive a safety net of benefits while reaping the benefits of working. My Life My Choice benefits from being a user-led charity whose work is delivered by learning disabled experts by experience. Our experts widely known for their skills and are asked for. Raising the profile and visibility of those with learning disabilities working in public settings has a wider benefit of increasing “understanding and acceptance” of people with learning disabilities (NDTI, 2014). It also silences those people who believe that people with learning disabilities are unemployable. Through this model we are proving that people with learning disabilities can do great work – they are visibly doing it every day! Find out more about what MLMC members think about working, with our series of “work story” videos. Closing the disability and employment gap, VODG, 2016. The Cost Effectiveness of Employment Support for People with Disabilities, NDTi, March 2014. Is Work Good for your Health and Wellbeing? Waddell and Burton, 2006.